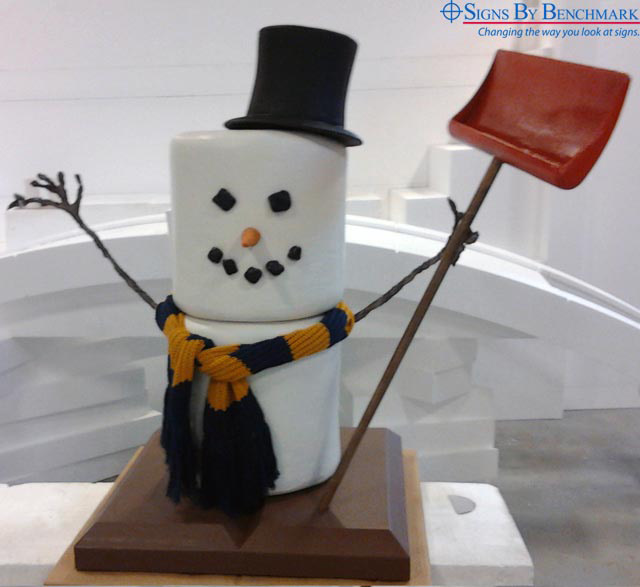 Permafrost Benny, a 3-dimensional “life-sized” marshmallow snowman, was created by Signs By Benchmark, a division of Benchmark Foam, from its lightweight expanded polystyrene (EPS) foam and signature sealing polyurea hard coat that ensures long life and durability. Embracing the idea of snowy weather, 3-ft. tall Permafrost Benny stands ready on a 3′ x 3′ replica cracker topped by a slightly smaller square of faux chocolate, made with an EIFS (Exterior Insulation Finishing Systems) finish. Hand-sculpted facial features bring this snowman to “life” as his hand (created from metal rod and sculpting epoxy) grasps a replica shovel. Completing his outfit are an EPS foam hat and knitted multi-color scarf. Signs By Benchmark can create architectural accents like Permafrost Benny for any holiday, occasion or event. Other advertising or promotional products that Signs By Benchmark has created include large float décor for Coca-Cola, custom 3D replica logos and much more. For your next event or promotion, find out how the Signs By Benchmark team can help personify a new or established image. Call us today at 800-658-3444 to discuss your ideas and enjoy a successful collaboration that will help enhance your own business – or the business of your customers. Signs By Benchmark is already taking orders for 2015. Call to reserve your spot!